Yesterday, Representative Elijah Cummings, along with the rest of the Democrats on the House Oversight Committee, released blockbuster information from a whistleblower who was at a celebratory event on Trump’s inauguration day. The whistleblower met and talked with Alex Copson, founder and managing partner of ACU Strategic Partners. Recall that I have been posting recently on Michael Flynn’s advocacy for a deal to build nuclear power plants in Saudi Arabia. I have focused so far on IP3 and their security arm, Iron Bridge Partners. First, I noted that IP3 believes US strategy in the Middle East has been to “resource conflict“. Next, I asked whether the Iron Bridge vision for security surrounding the proposed nuclear power plants actually anticipated the Saudi orb. Most recently, I described the chilling plans IP3 had for diversifying the Saudi economy. Flynn’s reported association with IP3 was preceded by an association with ACU. In the discussion to follow, it is important to remember that the Saudi proposals from ACU have concentrated on Russia building the nuclear power plants while IP3 initially proposed working with China and then moved to advocating the US building the power plants. When reviewing the information released yesterday, it becomes abundantly clear that Michael Flynn has been remarkably dishonest in his dealings since he was fired from his role as head of the Defense Intelligence Agency by President Obama. Here is just a partial list of key times Flynn has doublecrossed various entities. Note that Flynn says he doesn’t want Egypt talking to Russia about building nuclear power plants. We have learned that on one of his June 2015 trips, Egypt was one of the countries that Flynn visited. Was Flynn merely ineffective on this and other trips to the Middle East, or was he being duplicious? Just a few months later, we see this announcement from Egypt, on November 19, 2015, that Egypt and Russia have finalized a deal for Russia to build a nuclear reactor in Egypt. Further, the announcement mentions that a memorandum of understanding on the reactor had been signed back in February of 2015, several months before the Flynn trip that we know of. But that’s not all. Just over a week after this appearance before the committee advocating for the US to be in control of the Saudi nuclear plans, both Saudi Arabia and Russia announced an agreement for Russia to build the plants. A careful reading of these announcements and in some of the contemporary press accounts of them makes it look as though the agreement signed was very preliminary and seemed to be setting the stage legally for the two countries to get into more detailed discussions. In other words, it seems even more preliminary than the memorandum of understanding between Russia and Egypt the previous February, but it certainly seemed to set the stage for Russia to be seen as clearly the frontrunner for a later agreement on actual construction of the power plants. On January 20, 2017, according to a whistleblower, Alex Copson of ACU claimed that Flynn sent him a text while President Trump was delivering his inaugural address indicating that the nuclear project was now “good to go” and directing his business colleagues to move forward. Copson reportedly stated that “Mike has been putting everything in place for us” and that “This is going to make a lot of very wealthy people.” He added that Flynn was making sure that sanctions would be “ripped up” as one of his first orders of business and that this would allow money to start flowing into the project. Wow. There’s just no other way to read this than that Copson felt Flynn had been working for his group all along and that “ripping up” the sanctions against Russia were a key to getting the project rolling. And that has to mean that Russia building the plants was a central feature of their plans and their excitement over Trump taking office. That leads us to the next level of doublecrossing. The proposal — to develop a “Marshall Plan” of investment in the Middle East — was being pushed by a company that Flynn said he had advised during the 2016 campaign and transition. The firm was seeking to build nuclear power plants in the region. 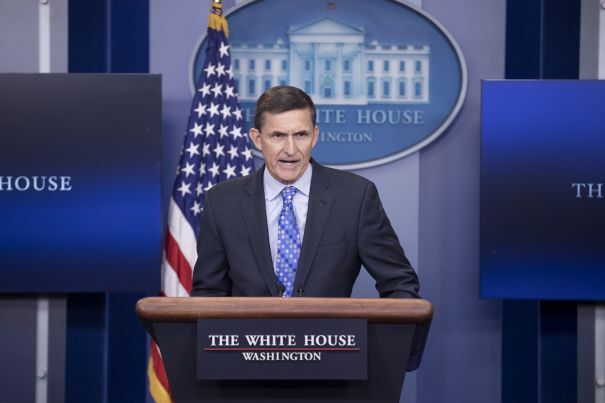 His advocacy for the project in the White House surprised some administration officials and raised concerns that Flynn had a conflict of interest. From August to December 2016, he said he served as an adviser to the company, IP3, reporting later on his disclosure forms that he ended his association with the firm just weeks before joining the administration. Before his association with IP3, Flynn served as an adviser from April 2015 until June 2016 to ACU Strategic Partners, which had its own plan to help build nuclear plants in the Middle East, in conjunction with Russian interests. In June 2015, he traveled to Egypt and Israel on a trip paid for by ACU to promote the plan. Flynn later failed to disclose the trip in his security clearance renewal application in 2016, according to Democrats on the House Committee on Oversight and Government Reform, an omission they said may have violated federal law. Got that? Flynn was with ACU from April 2015 until June 2016 and then IP3 from August 2016 until December 2016. But, the Post article notes that Flynn pushed an IP3-related article in the first week of Trump’s presidency, while we saw above that during the inauguration he was texting the head of ACU. [Note: I am still working separately to decipher the many changes of alliances of ACU, IP3, Iron Bridge and others] even though he had supposedly ended his relationships with both. It is very hard to come to any other conclusion than that Flynn may well have been trying to play the two groups off one another, only to then reclaim association with whichever one came out on top, doublecrossing the losing side. Now that Flynn has pleaded guilty to lying to the FBI about Russian contacts and is cooperating with Mueller’s probe, it is clear that he has doublecrossed Trump. After advocating for Hillary Clinton to be locked up, now it’s pretty hard to see how Flynn avoids prison time for his own crimes, even with a sentence that is likely to be reduced due to his participation in the Mueller probe. But given Flynn’s propensity for doublecrossing, I fully expect him to get caught violating the terms of his agreement with Mueller and wind up with some very serious time behind bars. It’s just who he is. That would be Michael Flynn. Thanks. Should have been clear. I get overwhelmed by my desire to see Mike Pence implicated. It’s frustrating to see that all the press reporting is that Flynn lied to the vp. We only have the lying vp’s word on that. Would Flynn also have been gaming the USG? That is, was he pretending not to be conflict-ridden by having continuing relationships with private businesses, where he and they stood to make a lot of money based on his actions as National Security Adviser? Where, in fact, that money was dependent on Flynn’s actions as NSA? Like Manafort, Flynn seems to have been either short of cash or greedy as Trump. We know that he and Manafort were short on even business ethics, which they seem to regard as the weakness of an enemy. Perhaps. But it seems likely to me Flynn was planning to rely on the revolving door. His compensation for the winning group in the competition getting wealthy would be for him to get a cushy appointment, and LOTS of stock, in the operation once his government service ended. But only after he made the right decisions as NSA regarding dropping Russian sanctions. Meanwhile, Nikki Haley wants American Olympic athletes to share Russia’s pain, saying that it’s “an open question” whether the South Korea she and Trump are making less safe would be safe enough for our athletes to attend the Winter Olympics. How do you say, “solidarity” in Russian, Nikki? I dunno. Capitalism mixing with foreign policy is business as usual. I mean, there is corporate profit to be had from nearly all government dealings. I can’t help feeling that sharing global security concerns with Russia along with making a plan for economic development in the Middle East via “Marshall Plan” methodology is a better route than heating up another Cold War with Russia, and continuing to provoke regional conflict via Islamic extremest groups while our military “occupies” pipeline routes and oil fields. Iran, Iraq, Afghanistan, Syria, Egypt, etc cannot maintain governance if there is no economy to employ the breadwinners that without a means to support their families are drawn to revolutionary extremism. This was something that “W” Neocons never thought of. War contracts and oil extraction was enough- except that 16 years later it’s not enough. “Going Nuclear” for energy will be the only way to drive growth for the 10+ billion humans we are expected to have on Earth, by the end of the century. The Industrialized nations can finish off the oil for their aging infrastructure while developing nuclear and alternative energy economies elsewhere. I can’t help but wonder just where Exelon fits into all of this. There’s got to be at least a bit part. It’s such a predatory outfit, and a perfect match in greed to the Trump bunch. In addition to Three Mile Island, they own at least a dozen nuclear facilities that should be decommissioned (as I understand it — can’t put my hands on the data right now) and the reserve funds they are supposed to put up for decommissioning under FERC are overdrawn. Exelon’s goal is to own the entire grid on the east coast, plus IL, PA — they won’t stop until they control it all in a monopoly. But I just haven’t been able to put the pieces together. Would appreciate knowledge sharing! flynn backing a mideast nuclear job with russia as focus via acu makes a LOT more sense than flynn being allied with a china based initiative. Going nuclear around the world for growth is more likely to end the world as we know it faster than would global warming. Partnering with Russians – or Chinese – on building nuclear power plants around the world presupposes better long-term relations than we currently have with either country. It seems wholly and dangerously beyond the capabilities of the present administration. That was before they gutted the State Dept. Doing so afterwards would largely cede the field to our erstwhile partner. Agreed. Just seems like were hitting critical mass on a number of issues facing humanity. I try not to be a cynic, but as intelligent conversations like these bear out, there are not a lot of good options when the greediest and most ill informed run the world. “it’s pretty hard to see how Flynn avoids prison time for his own crimes… But given Flynn’s propensity for doublecrossing, I fully expect him to get caught violating the terms of his agreement with Mueller and wind up with some very serious time behind bars.” All that they have alleged, and that Flynn has pled to, is lying to the FBI. Nothing else, nada. With that kind of sweetheart deal he’s already given up what Mueller wants from him. Hopefully it’s #$%^& Jared. Flynn may not draw much of a sentence. Scooter got a total of 30 months for 4 counts, one of which was lying to the Feds, and he never rolled over. Betrayus got off with a fine. This is after all not blue collar crime. Perhaps Trump will intervene and ask Mueller to go easy on Flynn, oh wait, we’ve seen that episode already. Judge presiding over MFlynn case recused. FISA involved? Now there is language stating “replaced” and “reasigned” instead of recused. Sniff; I wonder if the word “recused” requires an explanation.